The Strange Case of Origami Yoda is a very clever and amusing story based on a unique premise. Sixth grader Dwight, whom the other kids consider to be a clueless screwup, makes an origami Yoda figure that seems much wiser than Dwight is. Dwight wears the origami figure on his finger and when the other middle school kids have problems and ask Origami Yoda what to do, he always seems to respond with clever, though garbled, answers that solve their problems. But can his answers be trusted? That's the dilemma for Tommy, a sixth grader who needs the answer to a very important question. Can he depend on Origami Yoda's answer or not? Before he asks the question, which Tommy says is "about this really cool girl, Sara, and whether I should risk making a fool of myself for her," Tommy decides to investigate. 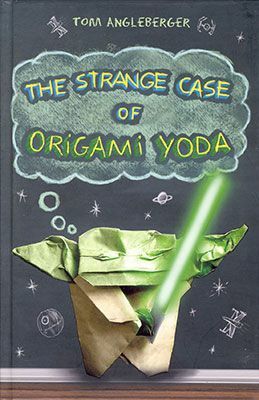 Much of the fun of The Strange Case of Origami Yoda lies in the appearance and format of the book and the differing perspectives on the worth of Origami Yoda's answers. In order to decide if he can depend on Origami Yoda's answers, Tommy decides he needs scientific evidence and asks kids who received answers from Origami Yoda to share their experiences. Tommy reports, "Then I put all the stories together in this case file." To make it even more scientific, Tommy asks his friend Harvey, who is an Origami Yoda skeptic, to share his perspective on each story; then, Tommy adds his own. The fact that the pages look crumpled and after each case, Harvey and Tommy's comments look handwritten adds to the illusion that this book was really written by Tommy and his friends. Furthering this illusion are all of the doodles Tommy's friend Kellen drew throughout the case file. Although Tommy says this first made him angry, he realizes, "some of the doodles almost look like people from school, so I didn't bother trying to erase them." The questions and problems the kids have are spot-on for middle school. For example, in his account, "Origami Yoda and the Embarrassing Stain," Kellen reports that Origami Yoda saved him from embarrassment and an in-school suspension. While he's at the sink in the boys' bathroom at school before class, Kellen spills water on his pants, and he reports, "It looked like I had peed in my pants." If he goes to class that way, he'll be teased unmercifully; if he waits for it to dry, he'll get in trouble for being late. Origami Yoda to the rescue, with the advice, "All of pants you must wet" and Dwight's translation, "...he means you need to make all of your pants wet so it doesn't look like a pee stain anymore." Problem solved! Harvey is not at all impressed with Origami Yoda's solution while Tommy feels that it did solve the problem. What confuses Tommy in this case and for most of the book is that Origami Yoda's advice is good, but if you ask Dwight for advice, "it would be terrible." In addition to the humor in each of the accounts and the differing views of Harvey and Tommy, there is also a growing awareness on Tommy's part that there is more to Dwight than a kid who is weird and always gets in trouble. The book ends with Tommy's decision, based on the appreciation he has gained for both Dwight and Origami Yoda, and the happy result. 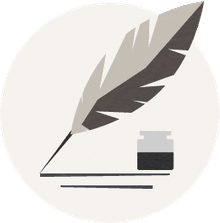 The Strange Case of Origami Yoda is the first novel by Tom Angleberger, who is a columnist for the Roanoke Times in Virginia. His second middle-grade novel, which came out in the spring of 2011, is Horton Halfpott.